The lawyer representing Supreme Court nominee Brett Kavanaugh’s accuser is a leader in an organization that has been directly funded by George Soros’s Open Society Foundation, reports say. 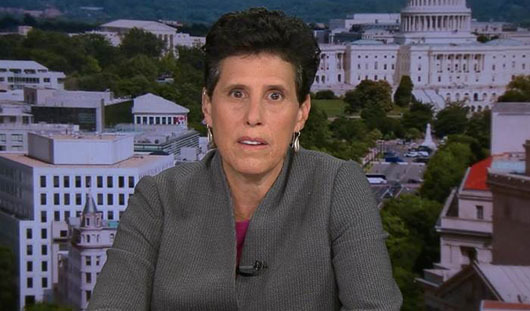 Debra Katz, who is representing Christine Blasey Ford, is vice chair of the Project on Government Oversight. Last month, Katz’s organization, along with several other left-leaning groups, co-signed a letter to Sen. Dianne Feinstein and Sen. Charles Grassley demanding Kavanaugh records. Katz has also donated thousands of dollars to Democratic candidates, including Hillary Clinton and Barack Obama. In June, the Daily Caller found “a new political advocacy group that vowed to put $5 million behind an effort to stop … Kavanaugh’s confirmation has significant ties” to Soros. The group, Demand Justice, gets its money from the Sixteen Thirty Fund – and the Sixteen Thirty Fund between the years of 2012 and 2016 received roughly $2.2 million from the Open Society Policy Center, one of Soros’s outlets. And Demand Justice’s mission is to advance a progressive agenda through the courts. “[Our goal is to] sensitize rank-and-file progressives to think of the courts as a venue for their activism and a way to advance the progressive agenda,” Demand Justice’s executive director, Brian Fallon, told The New York Times. Blasey Ford attended Holton-Arms School in Bethesda, Maryland, which is seven miles from Georgetown Prep, where Kavanaugh went. Washington Examiner columnist Paul Bedard revealed that an email sent to class members by a Kavanaugh “friend” on behalf of Katz “suggests without any evidence that the ‘odds are good that there may be other women who had a similar experience’ ” to Blasey Ford. Kavanaugh has unequivocally denied the allegations as have his friends, including his Georgetown Prep classmate Judge who Blasey Ford alleged was in the room. Kavanaugh has also claimed he wasn’t at the boozy pool party. Blasey Ford told The Washington Post that she told no one at the time of the alleged incident what had happened to her, including her parents. She said she was terrified that she would be in trouble if her parents realized she was at a party where teenagers were drinking. Wes Pruden, editor in chief emeritus of The Washington Times, wrote in a Sept. 17 column: “Why didn’t Mrs. Ford say something to family, friends or even her doctor at the time she said it happened? Why did her therapist’s notes say she told him there were four evil-doers in the bedroom and she now says there were only two? She doesn’t remember the exact year it happened, exactly where it happened, who invited her to the party, whose house it was, how she got there or how she got home. Yet it was so traumatic that she required psychiatric help three decades later. The Senate Judiciary Committee has called for Kavanaugh and Blasey Ford to testify on Sept. 24. Kavanaugh has confirmed he would testify while Blasey Ford has yet to confirm, reports say. “Democrats, in the midst of chasing an Anita Hill-type victory against Kavanaugh, would do well to read” Monahan’s tweets, Chumley wrote. The Democratic National Committee has said it would review the allegations. Ellison, who denies abusing Monahan, went on to win the Democratic primary for attorney general for Minnesota.